Still Hope for Fred Thompson? 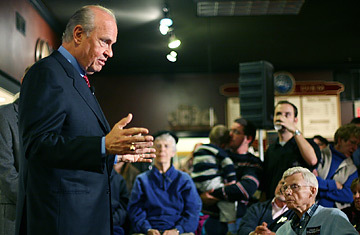 Republican presidential hopeful Fred Thompson speaks at a town hall meeting at Cafe Diem in Ames, Iowa, on Wednesday, Nov. 21, 2007. Fred Thompson is particularly fond of saying that "the proof is in the pudding." He invokes the phrase whenever he's asked if he entered the Republican race for the party's presidential nomination too late, or if he's spent too little time campaigning, or if he's worried about his lagging poll numbers. As far as the former Tennessee Senator and Hollywood character actor is concerned, his pudding will be proved January 3, when the voters of Iowa will finally have their say. "The pundits want to call the game in the third quarter," Thompson said in a telephone interview from his home in northern Virginia this past weekend, his one-year-old son Sammy gurgling in the background. "Historically speaking in Iowa, people who were leading at this time in the race do not win the race." Historically speaking in Iowa, however, candidates with aspirations of winning the caucuses have spent a little more time on the ground than Thompson has. So far, he has spent just 14 days in Iowa  a state where he himself has acknowledged he needs to place in the top three in order to survive  visiting 22 of its 99 counties. By contrast, former Massachusetts Governor Mitt Romney has spent 47 days and visited 68 counties, and former Arkansas Governor Mike Huckabee has been in the state a total of 53 days, passing through 52 Iowa counties. So as Thompson embarks on a 15-day tour during which he will hold more than 50 events in Iowa, many people can't help but ask if it's all a little too little, a little too late. "It certainly seems that he'd be at a competitive disadvantage due in part to his late entry," said Ed Wallace, head of the non-partisan Iowa Taxpayers Association, who is not endorsing a candidate this cycle. "You really have to connect with Iowans. And candidates slowly realize they have to answer some substantive questions for people to connect." And considering how formidable Romney and Huckabee are in Iowa, Thompson probably should have been working overtime just to have a chance. Romney, as of September 30, had spent more than $7 million of his $63 million war chest building an immense network of support in Iowa. And a surging Huckabee in the last month has lept into first place in Iowa polls on the strength of his Evangelical support (Evangelicals make up about 40% of GOP caucus-goers in Iowa). Thompson saw his highest poll numbers in Iowa over the summer when he finally launched his candidacy officially, after much breathless anticipation  at 16% according to the website Real Clear Politics. He's trended down since then and is now tied for third place with former New York Mayor Rudy Giuliani, someone who's invested even less in Iowa than Thompson, with 9.5% of support. Even though Huckabee is at 34% and Romney's averaging 23%, "we're very optimistic," Thompson said. "We're going to go in there and do what we do best and that is to go from town to town and store to store, from restaurant to restaurant talking directly to the people," said Thompson, who is bringing his wife Jeri and their two young children with him. "It's the way we campaigned in Tennessee where we went from 20 points behind to 20 points ahead. That kind of focus campaigning plays into our strength." Thompson firmly believes he can play well with Evangelicals, sapping votes from their current favorite, Huckabee. He has been on the attack  trying to show holes in Huckabee's record both in press interviews and in a mailing that went out last week that accuses Huckabee of being weak on immigration. "We've talked about immigration, we've talked about his record on taxes, we've talked about him wanting to lift the embargo against Castro and things like that and some of the stuff he switches his position on and some of the stuff he stays with," Thompson said. He also had some pointed criticism of Romney. His campaign has labeled Romney a flip-flopper on social issues such as abortion and gay marriage. When asked if the negativity could turn off Iowa voters, Thompson replied: "If you're supposed to go to the presidential elections without talking about the issues and where people's positions on issues that would be news to me." Thompson is also hoping endorsements from the National Right to Life Committee and the Wesleyan Center for Strategic Studies, an umbrella group for 40 million conservative Methodists across the U.S., will help him in Iowa. Just this morning he also received the coveted endorsement of Congressman Steve King, Iowa's most conservative Representative, who chairs the Conservative Oppertunity Society, a group founded by former Speaker Newt Gingrich. Thompson is promoting himself as the most well-rounded conservative in the field, on issues ranging from defense and fiscal issues to social concerns. The title of his bus tour: "The Clear Conservative Choice: Hands Down!" At this late stage, most pundits have all but given up on Thompson, but things can change quickly in Iowa. Says Steve Scheffler, head of the Iowa Christian Alliance, who is also not endorsing a candidate: "There's a possibility he could come back here and make a decent and impressive showing. Things are pretty unpredictable. And in the last poll 60% of voters were still undecided."